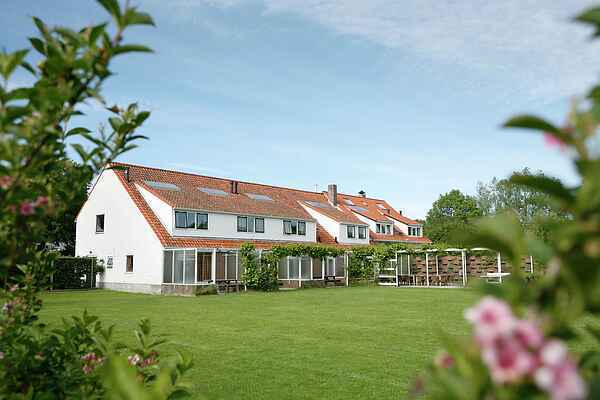 The many separate spaces and bedrooms in ‘Hoeve Zonzijde’ make this accommodation ideal for various groups such as families and groups of friends, with room for up to 34 people. It also makes a great base for activities such as classes, training programmes and team building exercises. There is a spacious living room with a fireplace and an open-plan kitchen as well as a separate dining room with a long dining table. There is also a separate TV room as well as an additional kitchen. The large private playing field next to the accommodation offers plenty of room for a wide range of sports. The house also has table tennis, a swing, Dutch shuffleboard, table football and hockey sticks with nets. And free WiFi of course. There is parking on site. There is a large terrace and garden furniture so you can sit outdoors in comfort.